The Commandment Killer is shockingly revealed to be wearing the long-deactivated OverLord armor and is using it to deadly effect. After a brief battle with the Dragon and his current ally, the villain flies off to retain his freedom and continue his plans. 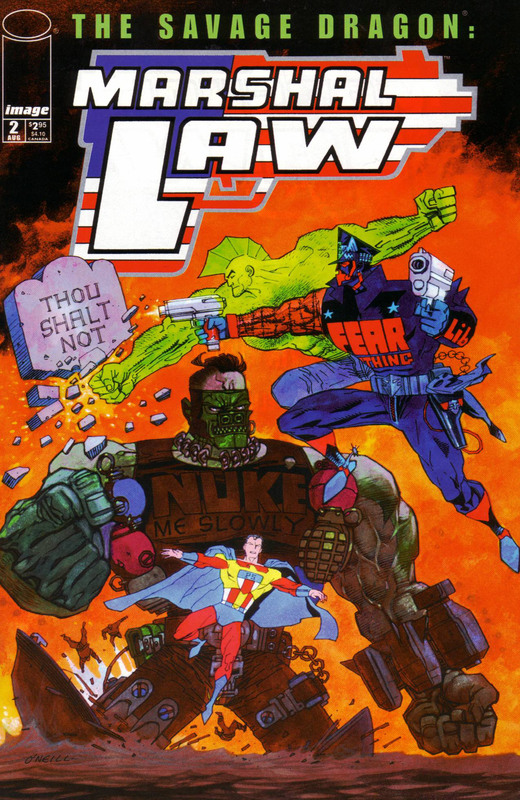 Marshal Law suggests that the possessor of the notorious armor is Mighty Man and quickly heads for his hospital occupation to confront Ann Stevens. Unfortunately, the blind hatred the hero-hunter has for the former Public Spirit had caused him to suspect the similarly powered World’s Mightiest Man. The matron of the ward is found brutally murdered, having been ambushed by someone she apparently knew and was unable to transform into her alter ego. Another victim, Rubber Johnny, is called into the San Futuro police station which leaves the two officers to step up their investigation. They head to the court case unfolding between Growing Boy and Public Spirit Junior. They are again too late to stop another superhuman being killed as the cowardly protégé of the original Public Spirit is skewered by Spirit of Justice statue. The patients of the hospital ward where Marshal Law works at are all questioned over whether they saw their matron’s murderer. None of them can come with anything that makes sense, lost in their own personal worlds within their minds. A sudden brainstorm by the hero-hunter prompts him to locate Suicida. The rogue superhero is the next target, but he survives with the help of Dragon and his nemesis. Both crime fighters then tail the Commandment Killer back to a museum for Golden Age Superheroes where they are confronted by the murderer, the simple-minded Sorry the Nearly Man. As he had previously failed to become a hero, he had become ashamed of other so-called heroes and sought to rid the world of them. Apologizing for his actions, the would-be hero/villain hands himself in to Marshal Law, his next target as, despite the policeman’s hatred of heroes, he is a true superhero himself. Realizing it was self-hatred, and rage against Public Spirit, the hospital ward worker rejects his agenda of hero-hunting. Dragon suddenly vanishes, being returned to the present era by whatever had originally brought him into the future. Cut the Cape! editorial by Pat Mills, and Hall of Maim character profile by Pat Mills & Kevin O’Neill.